5 Can You Litter Box Train a Pomeranian? 7.1 The moment I bring Pom puppy inside, he poops or pees. 7.3 My Pomeranian can’t hold it for more than an hour. 7.4 My dog does his business while I sleep without waking me. 7.5 Puppy poos and/or pees extremely early some mornings. 7.6 My Pomeranian uses the whole house as a bathroom. 10 Why Does My Dog Pees He Gets Excited ? 10.1 When I pick up my Pomeranian puppy, he pees. 14.1 Dog Urinates When Excited. Does Your Puppy Pees When Excited? Are Pomeranians easy to train? 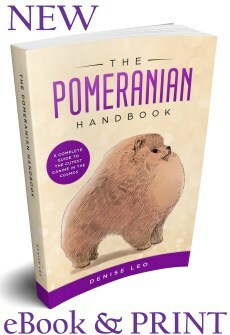 I receive so many emails asking how to house train a Pomeranian. Owners need to understand house training a Pomeranian requires much patience and perseverance in the first weeks. If you have purchased your Pom puppy from a reputable, registered show breeder your task will be so much easier. 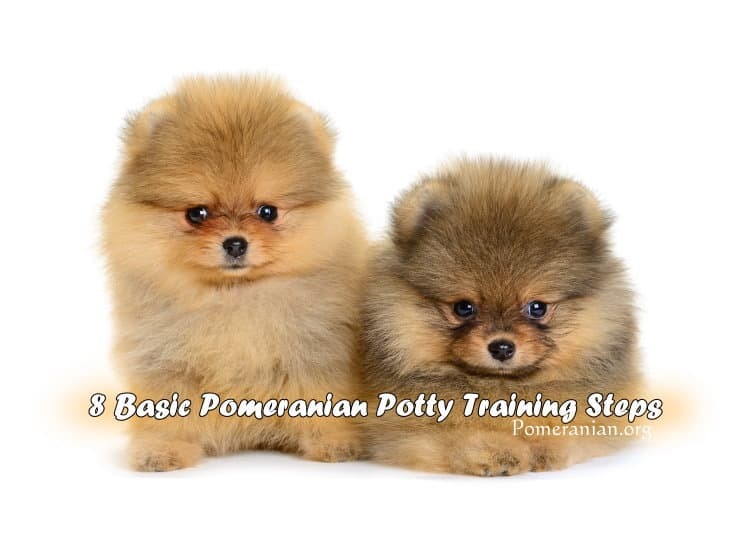 Pomeranian potty training problems usually arise with multi Pom puppies born and reared in dirty conditions. 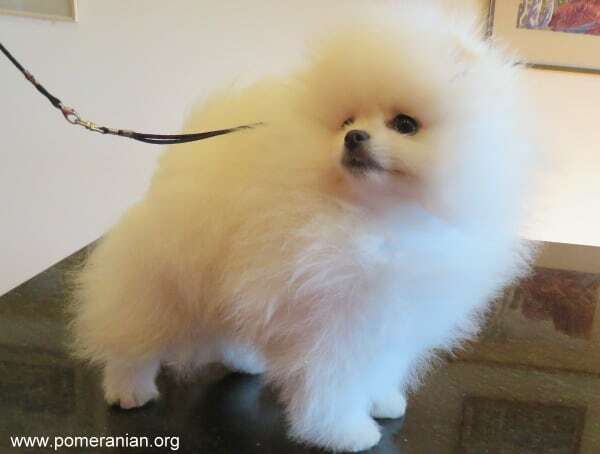 Most Pomeranian show dog breeders will have already commenced potty training Pomeranian puppies with training pads, newspapers or a litter tray . Dogs respond to odours and they’ll urinate where there is the smell of dog urine. Eliminate the smell associated with mishaps from your home by simply cleaning with white vinegar. Always take your puppy outside to “potty” after sleeping, eating and during playtime. Crate or confine your puppy to a small area at night and anytime you’re unable to monitor your puppy. When puppy urinates or defecates at the “potty” place, lavish lots of praise on puppy and give him a treat instantly. These actions tell puppy he has accomplished a wonderful thing. If preferred, you might include a command word while he’s performing his business. After success at the “potty” spot, puppy may have freedom of the home for a short period of time. The amount of time is based on his age. In the event of no results during a “potty break” after 5 minutes, bring puppy inside and place him in his crate for half an hour and then repeat the process. If you catch puppy in the act, yell NO and race puppy to the “potty” place. If puppy does “potty” more at the correct place, praise and treat. Thoroughly clean up the accident prior to returning puppy to the room. How long can a dog hold it? A young puppy must not be confined to a crate for lengthy periods of time. A general time line is to expect a Pomeranian puppy to be able to hold on for absolutely no more hours than the number of months of their age. 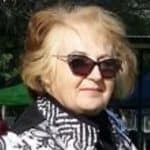 • Take your Pomeranian to an area where he or she can use the bathroom before he enters your house for the very first time. • After he goes to the bathroom, shower him with lots of praise! • Bring your new dog into the house and allow him to explore. • Anticipate times when he’s likely to need to eliminate (e.g., after eating, every few hours and before bedtime), and promptly take him outside. • Continue to praise your Pomeranian every time elimination happens, and he’ll be happy to receive your adoration and cuddles! • Should accidents occur (and they most certainly will), don’t scold or punish your adult dog. Clean the mess – quietly – and keep training him. Be proactive; an older Pomeranian won’t let you know when he needs to go to the bathroom, at least not at first. Eventually, he’ll understand and respond accordingly. The biggest mistake any Pom puppy owner can make is to bring a new Pom baby home, let puppy run around the home for a few days going to potty anywhere and then deciding to start house training a Pomeranian. Your home will smell like puppy’s potty place everywhere and your task will be a lot harder and slower to achieve. The baby pom is best kept in a playpen with clean newspaper down or puppy training pads, food, water and a comfortable bed at the other end of the playpen. The Pom puppy sleeps in this area and when I have to go out, I leave the baby Pomeranian confined to the playpen. As soon as puppy wakes up I take him or her outside to the area I want puppy to use as a potty area. I also take puppy to this area after meals and reward puppy when he or she has done the right thing with heaps of cuddles and tell puppy how clever and good he or she is. This takes a lot of patience and you must persevere, but doing this right in the first few weeks will pay in the long term. 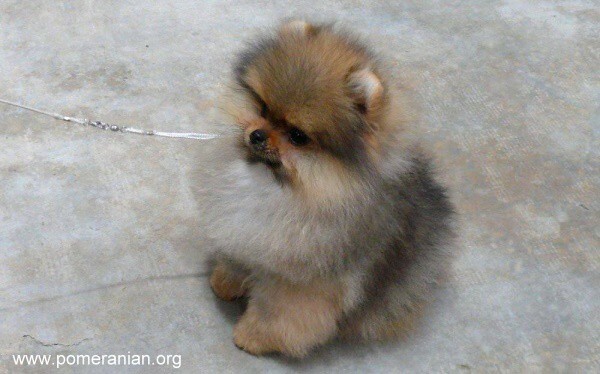 Remember your new Pom puppy is just a baby and accidents do and will happen. DO NOT SMACK PUPPY, SCREAM AT OR ATTEMPT TO RUB HIS NOSE IN HIS ACCIDENT. Any of above actions on your part will make your Pom puppy associate his actions of going potty with his human turning into a monster ! Your Pom will not associate your behaviour with the intended message he is defecating in an inappropriate place and next time he needs to go potty he will hide from you. Immediately take puppy to the potty area. Clean up the accident immediately and ensure there is no lingering smells or puppy will use this area again and again. If your puppy has been using a rug or newspaper you can place either item in the place outside you want baby to use as the potty area. The smell will help the puppy associate this area with going to the toilet. Helpful items to aid potty training your new puppy are reusable, washable potty pads. Another option is disposable puppy potty pads. Purchase online at the best prices or from a lot of discount stores and pet shops ( I avoid going into petshops for fear of bringing home disease) and already smell to the puppy like urine. Place one of these where you want puppy to use as the potty place and the smell from the pads will encourage the puppy to use the pad. Another Pomeranian Potty Training product is indoor grass puppy potty. This product is a artificial grass type potty for your adult Pomeranian or puppy. Can be used indoors out outside. Easily hosed and washed. 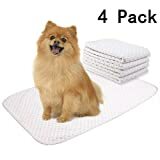 A great product if your intend to potty train your Pomeranian to use a patio area. White vinegar is an excellent cleaner to remove doggie smells and is safe on most carpets. Nobody wants their puppy to pee whenever and wherever they feel the urge. This is why pee pads were invented. Define a space where your Pomeranian will spend his time when home alone. This may be in a canine playpen or a gated area of your home. Even when you’re at home, ensure your Pom can enter and exit that area when he chooses. Whenever he looks like he needs to go potty, take him to the pee pads or some newspaper placed on the floor for that specific purpose. Every time he uses the pads or paper properly, regale him with affection and rewards. This can be treats or hugs and kisses and genuine excitement that he has done it in the right place. He loves attention and praise so gradually he’ll associate the praise with doing his business in the designated areas. If he misses the pad, put his feces on the pads for a brief period, giving it time to add the scent to the pad. If he misses when peeing, wipe up the pee and put the paper towel on the pads for the same reason. A puppy may be confused when being taught to use pads. If so, cardboard is another method that can be used. A cardboard box is ideal as a “designated toilet area.” Get a sturdy box without a lid. The best place for this is in your Pomeranian’s “home” area. It needs to be stable. Cut a doorway all the way down on one of the sides so he doesn’t have to step up and over to get inside. The box will then surround the pad and feel more like a specific area than just a pad dropped on the floor. Each time you take your new puppy to do his business, have him on a leash and guide him to that spot. Gently guide his entry into the box, and make him stay there with the leash, without letting him leave. A puppy may take up to 15 seconds so you need to give him some time. Every time he’s successful, lavishly praise him so he understands that’s where he needs to go every time he has the urge. As time marches on and he gets better at going potty in his space, you can cut the walls down a bit. Once he clearly demonstrates that he knows this is the bathroom area, you can take away his box. This method is also great if you have a deck outside but no actual backyard so you want him to only use a corner of the deck for his bathroom business. Can You Litter Box Train a Pomeranian? Yes, you can you train a pomeranian to use a litter box. This is an easy task to accomplish with a young puppy. 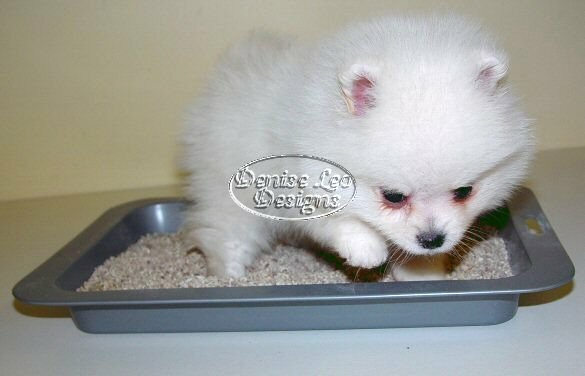 I have litter box trained many Pom pups here at Dochlaggie Pomeranians. This is the easiest to start at around 3 weeks of age. I place a very low tray of kitty litter at the entrance to the baby’s bed. The first thing the pom puppy steps onto when getting out of the bed is the kitty litter tray. As the Pomeranian pup gets older I move the litter tray further away. If your require your Pom puppy to be litter trained speak to your breeder on the subject of Pomeranian potty training prior to purchase. 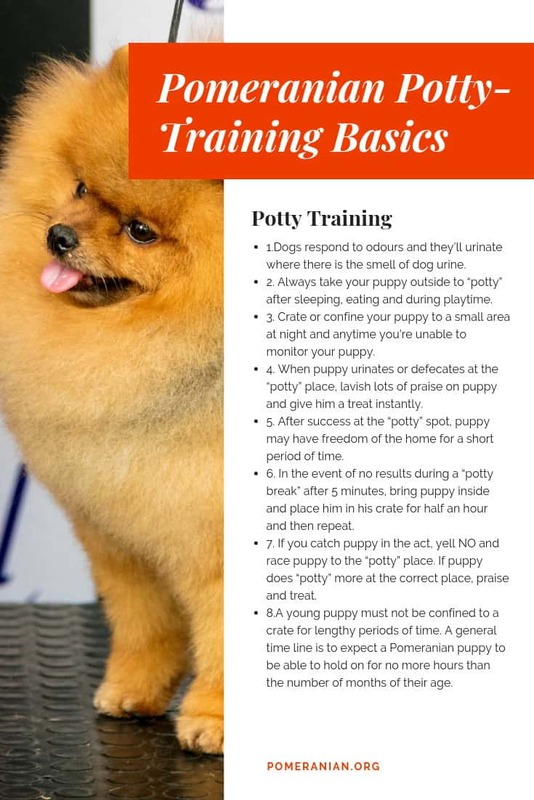 What happens if you decide you want to rescue a Pomeranian… and you discover that he or she doesn’t understand the meaning of the word “housebroken?” In that case, it’s time for some old-fashioned potty training! • An older dog has more control over his body, and can hold his bladder longer than a puppy. • An older dog will likely respond to a consistent schedule quickly. • Play with him outside. • Take puppy to his designated bathroom so he can pee before you play. • If he gets too excited, approach him from his side and begin playing slowly. • If your puppy does urinate, don’t pick him up immediately. Instead, kneel next to him, pat him slowly and calmly, then roll him into your lap. This stops the excited feeling of being picked up. The moment I bring Pom puppy inside, he poops or pees. • Make him focus on one task and give him ample time. • Don’t let him multi-task or roam the yard. • Use a six-foot leash or a retractable one that goes out to six feet. • Stand in the centre of his designated space and let him circle within it. • He might sniff and look around but don’t disturb him by talking or playing. • It would be great if your puppy did his business on cue. However, some need 15-20 minutes for their bowel muscles to relax before a movement. • If he pees, he might only half empty his bladder and need more time to expel the rest. • Sit outside with a good book or your phone and give him time. If he needs to pee the minute he comes in, have him sit in your lap because dogs won’t pee on their owner normally. 1. If he has a health problem making his bladder weak. 2. If he’s highly stressed. 3. If his need to go is too strong to hold on. Don’t keep him in your lap more than 10 minutes before carrying him to his bathroom, where he’ll probably pee easily. My Pomeranian can’t hold it for more than an hour. If he suddenly loses control of his bowels and/or bladder, this may indicate a health problem that must be checked first. Once the vet determines there’s no health reason, you can look at other possibilities. Apart from health problems, generally the solution is that he needs to strengthen his bowel and/or bladder muscles. Very young puppies won’t have much control. As they grow, their muscles get stronger but how much stronger they will get will partly depend on what you do to help. If you took your 8-week-old puppy out to the garden every two hours, and stuck with that as he turned three and then four months of age, he’ll get used to going every two hours. The answer is to increase the time between visits. There must be a good balance between taking him outside and supervising him. Use the supervisory or confinement methods covered earlier. Your goal is to increase time by 15 minutes and then keep increasing slowly as he gets better. If he’s used to a three-hour interval and you try to get him to hold it for eight hours, that’s impossible. Only the incremental way will gradually work. My dog does his business while I sleep without waking me. 1. Take your puppy out one hour before bed and again 20 minutes prior, allocating the 15-20 minutes previously covered. 2. Don’t feed him anything after two hours before bedtime. 3. However, never restrict his water.4. Place him in a confined space so messes don’t appear all around your home. The playpen mentioned earlier is a terrific idea. If you don’t know he needs to go, he’ll likely use the pads provided5. He needs sufficient activity and exercise throughout the day, so he’ll sleep when it’s time. This means 2-3 20-minute walks each day and a 20-minute cardio session (playing fetch or something similar). Puppy poos and/or pees extremely early some mornings. 1. Make his last meal an hour or two earlier than normal. It will increase the chance he’ll use the bathroom last thing at night. If you do this, give him a small dry snack at his normal dinner time. 2. Sometimes it’s the opposite that works. Feed him two hours later in the evening so he may not have a bathroom urge until two hours later than he usually does in the morning. Again, give him a small dry snack at his usual meal time. 3. Give your dog more exercise each evening. Don’t do it too close to his bedtime but if you play fetch for a couple of hours or take him for a long walk, he’ll be more tired and should sleep through the night and NOT want to go to the bathroom while you’re still deep in slumber. 4. Certain noises can wake your dog. It could be birds chirping, a door closing or loud voices outside, etc. Perhaps you have a quieter location for his sleeping area. Alternatively, a white noise machine can block out annoying sounds. 5. Your dog bark when he wakes up as he’s feeling bored. You might assume he needs the bathroom so you take him out. He’ll pee only because he’s outside. However, if he had something to keep himself busy when he woke, he may not have barked and disturbed you. Placing a treat release toy in his sleeping space after he’s asleep can keep him happy if he wakes up, and will save him barking. My Pomeranian uses the whole house as a bathroom. 1. If he completely empties his bladder and it began suddenly, it could be a urinary tract, or bladder, infection so it’s vet time. 2. If it’s only a sprinkle, often in the same spot, he may be marking his territory. Read the “Marking” section for more information on this topic. 3. If your dog simply hasn’t understood your rules, you’ll need to start from the beginning again. 4. You may have spent months training your pet, but if you find faeces and urine all around your home, something didn’t go according to plan…perhaps a step was missed. If you skip steps to save time, you actually waste time. 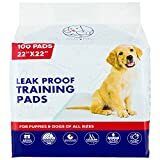 • Use a pee pad holder and the best one available is the Dogit Training Pad Holder. Its raised edge contains all puddles and it securely holds a pad. You can also buy cat litter boxes that act like quality pee pad holders. • Ensure he has the ideal chew toys to keep him satisfied; great “stay busy” toys to occupy his time; 20 minutes of cardio exercises and 2-3 walks each day. This should release all his pent-up energy and stop him feeling restless. This can happen if his area is too big (e.g. half a room divided with gates). However, his space can’t be too small either or he’ll feel claustrophobic, causing emotional and physical stress. The ideal space should be just big enough for a bed area, space for water and food, a toy play space and pee pads. It’s rare for a dog to soil his belongings so this sized space strongly encourages his use of pee pads. A playpen that’s 8-foot square and 24 inches high is perfect for a puppy. Once he becomes an adult, you can get extensions. Pomeranian dog submissive urination is defined as what a dog does when he sees, or interacts with, his owner, other dogs or people. It may be confusing because you may think he has simply lost control of his bladder because he’s scared of something. An owner may be very worried if this happens, especially if you have never given him any reason to behave in that manner. • Dribbling or emptying his bladder, like he has lost control. • Behaving in a submissive manner (cowering and possibly also shaking). • Looking up at a person with a frightened look or hanging his head in shame and refusing to make eye contact. • A submissive grin. People may mistake this for a nasty growl because the dog’s teeth will be visible, but it actually causes the corners of the mouth to pull back in a canine form of appeasement. Why Does My Dog Pees He Gets Excited ? • Overload of his senses. When I pick up my Pomeranian puppy, he pees. Health problems such as a urinary tract infection (UTI), kidney troubles or an infected bladder. Your dog should be taken straight to the vet if you even think any of these issues exist. Problems with house training a puppy If this is the case, he’ll urinate in the house when you’re not in sight as well as when you are. Marking. If this is the case, he’ll urinate inside your home in a spray, not a full bladder release. Never force him to interact with dogs around him. Begin work on desensitizing and socializing him so he grows used to being around other dogs. 1. Take him to his defined bathroom area frequently. If you believe you’re doing this, add several more trips per day. 2. Avoid direct contact straight after he pees. If he’s prone to peeing as soon as you come into the house, ignore him, pour a glass of water, read your mail and then pat him. 3. Never stand over him. Always kneel or sit down to greet him. 4. Never stare at your beloved pet as you greet him. Look to one side at first. 5. Your first physical touch shouldn’t be a pat on his head. Either touch him under the chin or on his chest at first. 6. If your dog does urinate submissively, don’t react. Keep calm and have a neutral face and relaxed body. Collect the cleaning products and clean up his mess. Your dog’s behavior should get better over time. If it doesn’t, you may have to speak with the vet to determine if he has any health problems that may affect his bladder. Dog Urinates When Excited. Does Your Puppy Pees When Excited? If he loves visitors and will urinate because he’s excited, let him greet them outside before allowing them all to come in. 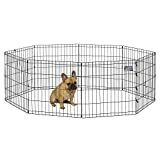 • If he’s scared of visitors, place him safely in his playpen area with toys and his bed so he feels comfortable and safe. If it happens with friends and you trust them to help you, ask them to follow the guidelines mentioned under the heading “in your presence,” as listed above. How do I stop my dog from peeing when excited ? In every case, it’s crucial that you begin to teach him commands or restart it because this is a guaranteed method for giving him a self-confidence boost.